What Makes these Two Languages so Difficult? Some people find learning a new language to be an intimidating experience. This need not be the case. There is no such thing as a person who is unable to learn a new language. The first step is to believe you can learn French, because you really can. The second step is to relax and enjoy the process. After all, it is known as the language of love –and like love, it is simply a matter of learning how to express yourself. It just requires learning a few more rules so that you can communicate effectively. As an English speaker, you will find that French is actually one of the easiest languages to learn. It doesn’t require learning an entirely different alphabet (like any Asian, Russian, Arabic, or Greek language). The sentence structure is also very similar to English, making it easier to start speaking in sentences once you have acquired an adequate vocabulary. The biggest differences between English and French lie in their sounds and grammar. Many of the sounds are also the same, though there are some unique sounds that you may not have been exposed to previously. Nor do the same letters translate to the same sounds. For English speakers, learning to pronounce some sounds in French can be tricky; trying to spell words correctly can also be entirely problematic. However, there are plenty of similar instances of strange additions (mouse – mice), silent letters (psychology), and unexpected sounds. The other big complication is the use of gendered nouns. They do not follow the rules that you may expect them to, so memorization is going to be the key in getting them right. It’s important for you to understand where the differences are and why they exist. It may not be easy to understand initially, but as you delve further into the language, the rules start to make it easier to understand and predict the sounds and spellings. 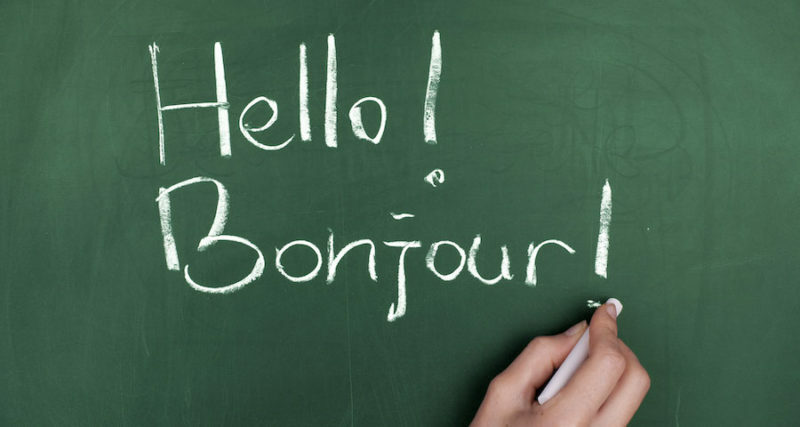 Native-English speakers who are learning French may initially stumble because some of the differences between the two languages come as a surprise. This is because we tend to take our own native languages for granted, but they reflect the way we think and our cultures. To keep you from being blindsided, here are some of the biggest differences between French and English. It won’t be as difficult as some other languages because English has been incorporating French into its roots for centuries. This means there are more similarities than you may expect. Keep in mind, the vocabulary is going to be very different, but that is something you can sit and memorize. Getting the right grammatical rhythm is far trickier and knowing the potential problems ahead of time can help you start to reprogram your thinking as you learn. There are many differences between these two European languages, but these are the 10 that tend to cause English speakers the most trouble when learning French. All French nouns are either masculine or feminine. Sometimes, the gender of a noun is directly related to the gender of the thing it’s referring to. More often, the gender is completely arbitrary, and it will require memorizing the words and their genders. There are many French words that are gendered based on their endings. By paying attention to common endings, you can start to guess the gender based just on the word’s ending. There are some words with other endings, but looking at the ending of the word is usually a good hint as to the gender of the word. Gender affects sentence construction, too. The article must match the gender of the noun: the English word “the” is either the masculine or feminine. Other parts of speech, including relative pronouns and adjectives, must also match the gender of the noun. For most native English-speakers, gender is one of the most complicated new rules to grasp. Once you’ve gotten the gist of it, you’re well on your way to mastering French grammar! Something you don’t notice when speaking English is that you use the adjectives first, giving the person the description of an object before they know what the object is. For example, you can talk about the large, red truck in English. In French, the adjectives typically comes after the object, so you would talk about the truck large red. That means that the person listening to you will have an image of the object, and will then impose the description over it. There are a few exceptions to this rule that you might encounter because some types of adjectives work differently. One example is a quantifier, which is an adjective that describes how many of something there are. You would say “the house white” instead of “the white house,” but then you say “the only house.” At least for now, focus on learning to think of putting the adjective second. This will help you start to speak a little faster with fewer obvious mistakes. In English, there are many prefixes that can be added to various words to create the opposite of that word or negate its meaning. For example, there is the difference between “efficient” and “inefficient” or “grateful” and “ungrateful.” There are also negating words, like “no” and “not.” There are right and wrong times to use all of these, and it can take years for children to learn the proper use of these words. This is not a problem in French because you can negate any verb by simply putting “no” before it. Also, French uses double-negatives as the default. This is why “I don’t want nothing” is correct in French but not in English. English is heavily influenced by French, and French is heavily influenced by English, so they have many words that are very similar. The thing to watch for is that many of the words that appear to be similar aren’t. For example, there are several words that sound almost identical to English words, but “assister” means “to attend” (not “to assist”) and “formidable” means “great” (not “fearsome”). So as you learn vocabulary, you are going to need to check the meaning before assuming you know based on any similarities to English words. In English, we talk about feelings using some form of a “being” verb, like “am.” In French, the verb “to have” is often used instead. For example, instead of saying “I am 20 years old,” a French-speaker would say “I have 20 years”. This is similar for many other traits, such as hunger (“I have hunger”) or fear (“I have fear”). There’s a long list of words that use this construction. Keep an eye out for “to have” conjugations in your studies! English relies heavily on prepositions to provide details in discussions because we focus on describing where something is oriented in time and space. For example, “The cat is sitting on top of the chair, and the dog is sleeping under it.” While French certainly has prepositions, there are fewer of them in French than there are in English. This can cause some ambiguity for English speakers who are accustomed to more precise descriptions of location. A single French preposition can be used for several different prepositions that we use in English, and it may take a while to learn when you can use a particular preposition. Learning exactly what is meant by these prepositions can be challenging for English speakers, but having fewer words to choose from can also make it much easier to remember all of them. English speakers use tense largely to show if something happened in the past, present, or will happen in the future. French takes a slightly different approach, using tense to convey specific meaning. This isn’t entirely foreign to English speakers because we tend to use perfect tense in the professional world. It is similar in French, but it is used in every day speech, not just to show professionalism. One of the most noticeable differences in punctuation between English and French is that French often uses contractions. Articles and pronouns are contracted, combining them with other words to simplify speech. Once you learn how to do it correctly, you will find it much easier – it just takes a bit of work to get it to feel natural. It’s the only European that is more notorious for its difficult spelling than English (and it is a large reason why English is so difficult to spell). Like English, there are a lot of silent letters, just not typically the same letters. As you learn vocabulary, take the time to memorize how each word is spelled so that you can consistently spell it correctly. You can also imagine the word as you speak, and over time it will get easier to see the patterns. Does Age Matter If You’re Trying to Become Fluent in a Foreign Language?